For $4,800, All Hail El Previno! Let’s start off with three little words: mid engine pickup. 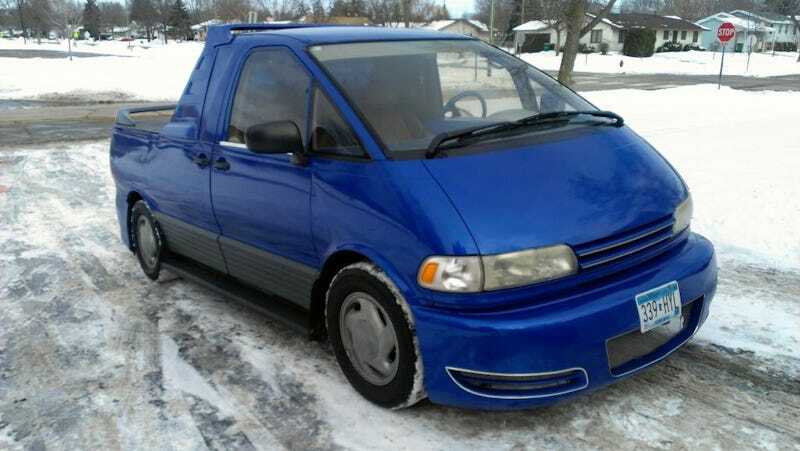 If that piques your curiosity then perhaps seeing today’s Nice Price or Crack Pipe custom Blue Previa will totally blow your mind. That is of course if its price doesn't just blow it. Jay Leno used to shill Doritos using the slogan crunch all you want, we’ll make more. And while Jay’s a fanatical car guy, it’s doubtful he would advocate similar similar advice regarding BMW’s 310-bhp hand-built engineering marvel, the S38 B36. Nonetheless, yesterday’s 1991 E34 M5 had its original mill crunched - or lunched, or whatever - and thankfully for its then owner, BMW made more. That spankin' S38, along with a clean presentation and some unique features were enough to overcome the present owner’s twenty one grand asking price, squeaking it across the line in an amazingly narrow 50.1% Nice Price win. If you, like ‘80s Jay, happened to have the munchies, that Bimmer would have been perfect for a late night run down the Autobahn to the local Sieben Elf convenience store. If, however, you were instead planning a kegger then you might be better off with today’s 1996 Toyota Previa custom pickup. High on the list of the world’s greatest head-slap, why didn’t I think of that moments comes this Minnesota-based Previa with a bed. Now, cutting a chunk of a unibody vehicle’s structure away is usually a recipe for disaster, but this truck’s so awesome looking that we’re going to trust that it doesn’t drive the same way a boneless chicken makes sweet chicken love. Starting with a ’96 automatic-equipped non-SC van - which means a 135-horse 2TZ four pot laying down on the job - the builder of this custom has removed much of the roof, and along with it a bunch of its minivan stigma. What's been added in its place, is a whole lot of awesome. The original Previa trailed its competitors in the door department, lacking an off-side (in the US) slider. That plays to this custom’s advantage as it has but one gaping hole to address as opposed to two. That side door is still there, evidenced by its shutlines and handle, but it does appear to have been welded shut for good. Above that a cab cap with integral air management device and jaunty strakes frames a rear window onto which the word UNIQUE has been applied in a classy serif font. The ad notes that the electric blue paint was applied just last summer, and they really got their money’s worth as it extends to the interior of the 119,000 mile truck as well. It’s not all puppies and flower fragrance farts however, as the ad notes to there being a crack in the massive windshield. Perhaps that's the result of the removal of a significant source of the vehicle's torsional rigidity, or maybe it's due to someone hugging it too tight because it's amazing. Who knows? Fortunately Previa windshields aren’t all that dear. The ad also says the lower ball joints in front are worn out, but that otherwise it drives just fine. The body mods look reasonably professionally done - with the singular exception of that cap back, which appears pretty obviously to have come from something else. Surprisingly, the wheels are the stock Previa alloys rather than aftermarket ba-bling, ba-bling and presently fail to live up to the audacity of the rest of the customized truck. On the inside, the dash is kind of crazy-making in its new blue and silver hues, while it appears that the leather seats - if the corner of the passenger's throne in the pic is any indication - have taken on the color and texture of an elderly hippo. This custom Previa is a perfect example of the yin and yang of desirability. An amazing realization of what probably started out as a pencil sketch on college rule in the back of a high school stat class, it’s also most likely doomed to a short, jello-emmulating lifespan due to the compromised structure. Still the candle that burns twice as bright, yada, yada, yada. To light this custom Toyota’s candle, you’d need to come up with $4,800 to fuel the flame. What do you think about that asking price? Is that an amount that’s a fair deal to pick up this Previa? Or, Does that price make this custom a must-run-from? Minnesota Craigslist, or go here if the ad disappears.